Indian team just finished their 4 match test series against Australia in down under and now they will be part of 2015 tri-series against Australia and England which will be followed by the big 50 over ICC Cricket World Cup taking place in Australia and New Zealand where India will be defending their world cup title. 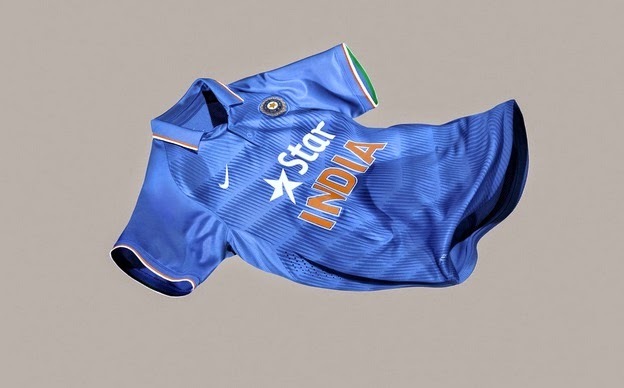 Indian team and Nike has released the new official kit for 2015 tri-series and world cup. Team India and captain MS Dhoni lanuched the new kit ahead of their first game in the tri series and following images are the official kit which india will be using during world cup 2015. The new kit features the traditional blue colour shirt with a polo collar with white and yellow application across the shirt. Shirt also feature a big big logo of team India sponsor “Star” along with BCCI logo on the left side and Nike logo in the right side. While there is a big text “INDIA” on the front of the shirt in orange collar and we can also see orange colour used on the end of cuffs and outline of pockets on trousers.